A RootsWorld Music of the Month selection. This CD was donated by the the artists to support the publication and broadcast of RootsWorld magazine and radio. Central Europe influenced by jazz, rock, pop and rhythm and blues. 100-year-old songs with a contemporary feeling. Old lyrics with a new groove. Traditional instruments with a modern sound. 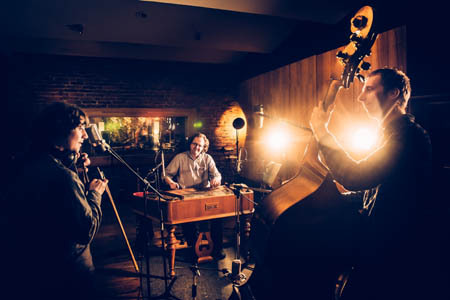 Ponk, an innovative new trio from Moravia in the Czech Republic, came together in 2013. Moravia, and especially the Czech/Slovak border region, has one of the richest living folklore traditions in Europe, with diverse dialects spoken and customs, traditional costumes, dances and musical styles that vary greatly from village to village. Postfolklor, Ponk's debut album, draws heavily on these traditional musical motifs, yet the band manage to give these traditional sounds exciting new life with their unconventional modern treatment. The unique texture of Ponk's music is largely down to the sound of the traditional Hungarian Cimbalom. 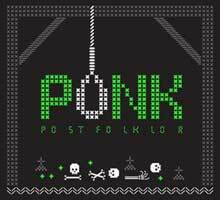 Unlike traditional folk musicians, however, Ponk make use of the instrument's entire sonic and rhythmic potential, often producing sounds reminiscent of some strange new rock guitar. Likewise, the double bass has abandoned its traditional folk sound to follow new melodic, rhythmic and percussive paths. Ponk's overall sound is complemented by an instantly recognisable "dirty" violin sound, with intentionally non-folk, rock phrasing. Add to this, distinctive lead-vocals layered over creatively constructed harmonies and you have a unique and distinctly post-folklore sound grounded in pop, rock, blues, metal, hip hop and RnB that breaks all boundaries of the genre. Jakub Nožička - double bass & vocals. All contents of these web pages ©2000-2015 FNI Multimedia / cdRoots unless otherwise stated.